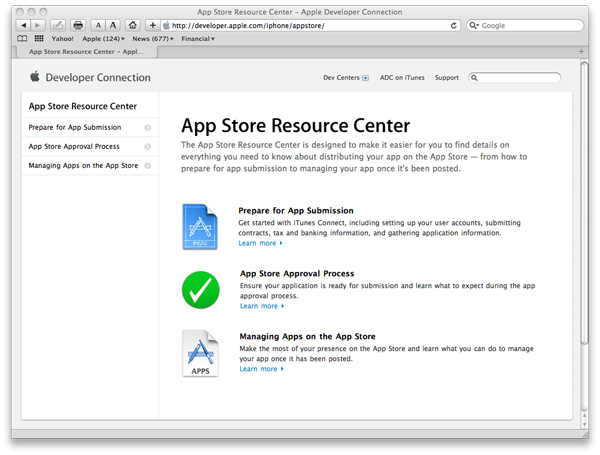 Following a chorus of criticism for a perceived lack of communication on the iPhone App Store approval process, Apple recently unveiled its new Resource Center for developers, and AppleInsider offers a peek. The new, private page for developers shows how to prepare software for submission for the App Store, details Apple's approval process, and explains how to manage programs already available in the App Store, sources familiar with the matter have said. Tutorials reportedly include everything from creating an account to tracking sales and trends. Developers are required to include a list of information with their application, including device requirements, contact information for support, an end user license agreement, and age ratings. In July, Apple added keywords to software to improve the App Store search. Developers enter words that might help users find their software through a simple search of the store. Perhaps most interesting to developers is the approval process. Some have expressed confusion as to why their software is rejected from the App Store, and have complained that Apple has not been forthcoming with details on the process. In a section devoted to the approval process, the new Resource Center offers a run-down on the iPhone Developer Program License Agreement. Sources said this gives Apple the right to reject an application based on functionality, content, impact on a cellular network and more. The site reportedly notes that 87 percent of applications are approved within 14 days. The information center notes that software is downloaded and tested on both an iPhone and iPod touch, and is tested for bugs, instability and unauthorized uses, as well as issues or content that could raise privacy or decency concerns. There are allegedly nine status levels for applications submitted to the store, ranging from in review to ready for sale, or rejected. Based on new data from AppShopper.com, the number of approved applications seems to go in peaks and valleys. Last Friday alone, the App Store saw a peak of nearly 1,400 applications approved in one day, a significant spike. The new Resource Center also provides information on updating an application already accepted into the App Store. Updates are reportedly classified in three categories: high-frequency ones that address serious bugs, medium-frequency updates that bring small enhancements, and low-frequency updates that bring new features. Developers can also make changes to the "metadata" of software, including its icon, description, and screenshots included in the App Store listing. Changes reportedly take 24 hours to appear. While it does offer a great deal of information, developers have said there's not much "new" to the Resource Center. Various Developer Connection members who anonymously spoke with Ars Technica expressed frustration that the site is essentially "a collection of documents that were already out there, just condensed into one place." One person is quoted as saying the site is "totally useless." But even if it doesn't fix most existing problems, some might view the site as yet another step in the right direction as the App Store experiences growing pains. After numerous developers and Internet pundits voiced their complaints about the approval process, Apple's senior vice president of Worldwide Product Marketing, Phil Schiller, began to personally address various concerns. Last week, at least one developer said they were given a telephone number for direct access to Apple regarding App Store issues. While most developers do not have such access, the software involved was said to have earned more than $1 million in sales, leading some to assume that the feature was available for high-profile App Store developers. Beyond the approval process, iPhone OS 3.1 also brought about a new Genius recommendation system for software available for the iPhone and iPod touch. The feature suggests new applications for users based on software they have already installed. The handset maker hopes that the capability will not only make it easier for users to find new software, but also increase awareness of software that might have otherwise flown under the radar.